We all learn from history. Let me share you a brief history of KFC. This story is worth to read. Look at this picture below. Harland Sanders is the man in the KFC logo. KFC’s history can be traced back to the man who started it all: Harland David Sanders, or the man popularly known as the face and logo of KFC, “Colonel Sanders.” Sanders was born on September 9, 1890 in Henryville, Indiana and started cooking at a very young age to help out his working mother and family. salesman, railroad firefighter, farmer and even as an Army private. But it wasn’t until age 40 that Sanders really explored his love for fried chicken. In 1930, he cooked and served chicken meals for busy families in his small eatery called “Sanders Court and Café” which operated out of his service station living quarters. Eventually, the business boomed, prompting Sanders to expand his restaurant to fit 142 people. In the next 9 years as chef, he would perfect his fried chicken recipe. In 1935, he was given the honorary title “Kentucky Colonel” by Gov. Ruby Laffoon for his contributions to the state’s cuisine. Since then, Sanders referred to himself as the “Colonel,” and dressed in a “Southern Gentleman” outfit as a means of promoting the restaurant. Sanders officially went into the chicken franchising business in 1952, when he sold his restaurant after it was by-passed by a major interstate. He traveled the U.S. selling his concept of pressure-cooked chicken for a 5-cent royalty fee for every chicken sold. By 1955, he established Kentucky Fried Chicken. In the early 1960s, the KFC franchise totaled 600 stores in the U.S. and Canada. In 1964, Sanders sold his share for $2 million to a group of investors, turning KFC into a fast-growing corporation. In 1971 it was acquired by Heublein Inc. and was later sold to R.J. Reynolds Industries. In 1986, KFC was purchased by PepsiCo Inc. and was placed under its restaurant company Tricon Global Restaurants. In 2002, Tricon changed its name to Yum! Brands, now the largest restaurant company in the world with 32,500 stores in more than 100 countries. 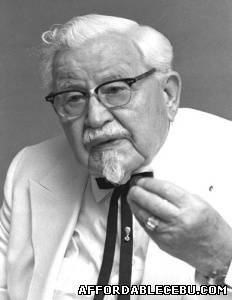 Colonel Sanders remained faithful to the restaurant he loved and nurtured for so many years. He traveled 250,000 miles a year to visit KFC stores found all around the world. In 1980, he passed away at the age of 90. Today, his memory lives on through his famously delicious fried chicken enjoyed by millions of people the world over.